On Nashville Season 2 Episode 15 Teddy breaks the news to Rayna that her father, Lamar, had a heart attack in his office and died. 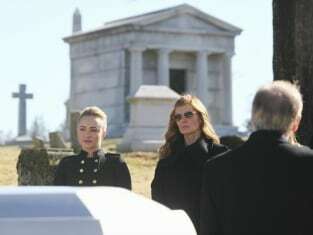 Rayna doesn't care that her father's dead because he was responsible for her mother's death. Juliette's Opry performance was the focus of a NY Times article that suggested she had shown considerable strength by standing her ground and she catches the eye of a big producer in Los Angeles who wants to take her to the next level. Deacon plays a gig with Avery, Gunnar and Zoe that prompts the latter three to form their own band. To find out about all of these stories and discover what went down between Scarlett and Liam, you need only watch Nashville online!